Aging can bring on a variety of health issues, but one of the key problems that affect many is overall weakness. The body's structural system tends to decline with age and muscle areas have been known to also cause a range of debilitating problems. Most people tend to see these changes as early as their 40s. So, what can you do to make sure your body stays strong as you age? The key is in exercise by building up muscle strength, you can keep your body strong as you age. When working out, focus on your upper body - strong trapezius, biceps and triceps muscles could someday make a difference doing basic tasks such as carrying groceries or your grandkids. And the weaker they are, the more prone you are to neck strain. It is also good to focus on your core. By working out and focusing on your core, you could begin to build up strength can avoid placing extra strain on your lower back. A little prevention goes a long way for back pain, which makes even the most basic tasks, like sitting or bending over, excruciating. To target all the core muscles, activate them during a workout. Another body part that weakens dramatically with age are the knees. Knees not only provide overall stability, but they enable you to walk with balance and this is important as you age since you will need the most balance you can get. When hitting the gym, remember your knees by doing some leg curls, and walking with a steady pace on the treadmill. This will also help your legs and other parts of your lower body. 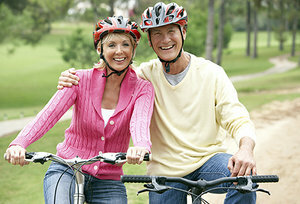 Doing overall cardiovascular exercises will also help you work out your heart, which is also essential for aging.